The recent conduct of various “Greenway” projects by the Department of Transport, Tourism and Sport has been extremely controversial and has generated unneeded conflict. In Galway, the main source of the difficulty has been a switch by state actors to treating greenway provision as exclusively involving the construction of new roads, mainly through working farms. This is either new roads along disturbed ground such as the long abandoned and now privately owned Clifden railway alignments. Alternatively, in East Galway the proposed new roads are to be constructed along new alignments through open farmland. Previously there had been an acceptance that in accordance with national policy, minor country lanes could also form part of greenway networks. Predictably this “build new roads” approach has generated serious conflict and acrimony. Out of this acrimony “Galway Cycling Solutions” was formed as a coalition of cycling and landowner interests. In January 2017 a delegation from Galway Cycling Solutions and farm organisations met Minister Shane Ross and Junior Minister Patrick O’Donovan to raise concerns. The delegation was informed a new process was to be developed. A consultation on a new Greenway Strategy was announced in May 2017 and received detailed submissions from interested parties around the country including the Galway Cycling Campaign. In July 2018 the Government published the resulting Greenway strategy document. In September 2018, this was followed with a €53 million funding call. If the Greenway Strategy had been circulated as a draft for discussion it would be a welcome step forward. As it stands the final document is flawed, seems to promise more conflict with landowners and the proposed strategy seems to be inherently unlawful under EU and national law. The strategy document does make an attempt to appear reasonable and to take into account various issues that were raised during the strategy consultation. There is talk of consultation with stakeholders – although there are apparent problems that are outside the scope of this article. 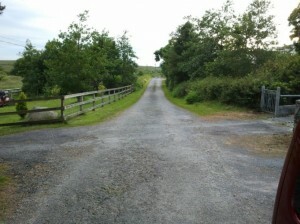 Picture: Section of the old Clifden road near Derryneen, In 2012 the county council accepted that this could be used as part of the western section of the Clifden Greenway. Then something seems to have changed and minor country lanes became unacceptable to the council for subsequent greenway proposals. A central problem remains an apparent focus on the construction of new roads. In the published strategy the authors use the words like “built” or “construct” where a credible and environmentally defensible strategy document would use words like “designate”, “adapt”, “create”, “provide” or “develop”. On page 18 the strategy authors specifically reference EU Directive 2014/52/EU. Directive 2014/52/EU is the latest version of directive 2011/92/EU “on the assessment of the effects of certain public and private projects on the environment”. The objective of the directives is not merely to ensure projects are carried out in a manner that protects the environment. But to ensure that “Effects on the environment should be taken into account at the earliest possible stage in all the technical planning and decision-making processes”. Any project may have an environmental impact purely through the manner in which it consumes resources. There is also an associated EU communication “COM(2011) 571 final Roadmap to a Resource Efficient Europe” which commits to the efficient use of resources and to the principles of sustainable development. (See below for relevant sections). These directives are transposed into Irish law under regulations such as the European Union (Planning and Development)(Environmental Impact Assessment) Regulations 2018 (S.I. No. 296 of 2018). As adopted into Irish practice and Irish planning law, there is a requirement for a developer to commission an Environmental Impact Assessment Report (EIAR) as part of the planning process. This report must include an assessment of reasonable alternatives that achieve the goal of the project. The environmental impacts of these alternatives must be compared. The intent is that a project with the least impact and most sustainable use of resources can be found. An EIAR is a key part of the planning process for projects such as new roads. When the National Planning Board “An Bord Pleanála” holds a hearing on a project is perhaps better thought of as being a hearing into the EIAR report rather than simply the project in isolation. Conclusion: the 2018 Greenway Strategy is contrary to EU and national law. The published Greenway Strategy does not reflect key areas raised during the consultation process. The latest Greenway Strategy document is focused on constructing new build roads as “greenways”. It acknowledges that motor vehicle access might be permitted to these greenways but not the opposite; that restricting motor vehicle access is an effective, established, way of creating a greenway-like experience on existing local roads. For local roads the strategy merely refers to traffic calming rather than roads management or traffic restriction and diversion. The document acknowledges that low traffic local roads have a role in cycling networks but frames this merely providing links to the greenways (new rural roads) constructed under this strategy. Therefore the apparent effect of the Greenway Strategy is to direct local authorities to propose schemes that involve building new roads through lands as a direct alternative to adapting existing features that already have an established value as cycling infrastructure. In effect this seems to be an instruction to propose projects that have higher environmental and resource impacts as an alternative to those that have lower impacts. This suggests that the Greenway Strategy is contrary to EU law on environmental protection and for many locations planning applications framed on the basis of the Greenway Strategy will be inherently unlawful under EU directives on the environment and hence unlawful under the Irish planning regulations. Reasonable Alternatives: 4.12. The Directive requires that information provided by the developer in an EIAR shall include a description of the reasonable alternatives studied by the developer. These are reasonable alternatives which are relevant to the project and its specific characteristics. The developer must also indicate the main reasons for the option chosen taking into account the effects of the project on the environment. (7) Over the last decade, environmental issues, such as resource efficiency and sustainability, biodiversity protection, climate change, and risks of accidents and disasters, have become more important in policy making. They should therefore also constitute important elements in assessment and decision-making processes. (8) In its Communication of 20 September 2011 entitled ‘Roadmap to a Resource Efficient Europe’, the Commission committed itself to including broader resource efficiency and sustainability considerations in the context of the revision of Directive 2011/92/EU. 3.1. Sustainable consumption and production 3.1.1. Improving products and changing consumption patterns Changing the consumption patterns of private and public purchasers will help drive resource efficiency and can also frequently generate direct net cost savings. In turn it can help increase demand for more resource efficient services and products. Accurate information, based on the life-cycle impacts and costs of resource use, is needed to help guide consumption decisions. 5.3. Ensuring efficient mobility A modern, resource efficient mobility system, serving both passengers and freight can contribute significantly to competitiveness and sustainability. The Transport White Paper24 puts forward a wide range of options for pursing the required holistic transport policy. Milestone: By 2020 overall efficiency in the transport sector will deliver greater value with optimal use of resources like raw materials, energy, and land, and reduced impacts on climate change, air pollution, noise, health, accidents, biodiversity and ecosystem degradation. The Cycle Campaign originally welcomed the news that a public bike scheme was coming to Galway – the expected implementation of the Jacobs report promised to be a step change for cycling in Galway with one-way streets finally reverting to two-way use for cyclists. Instead The Coke-zero bike scheme has not brought a universally happy time for cycling. In a move that seemed calculated to cause offence, and succeeded in that apparent aim, already scarce bike parking was removed to make way for public bike stations. Bike stations that were to replace car parking were dropped. One-way street restrictions continue to be applied to cyclists in a snub of the legal changes brought in by Galway TD (and Minister of State) Bobby Molloy in 1998. 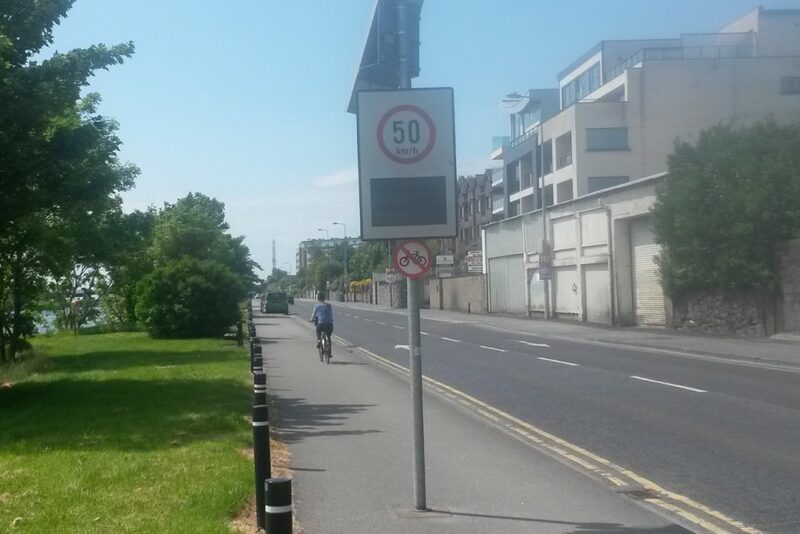 On Lough Atalia Road some time in early 2018, apparently in conjunction with the construction of badly needed new bikeshare station at the playground, road signs went up “banning” cycling on the seaside path. The use of roadside cycle paths or “cycle tracks” can also be problematic for people on bikes when it comes to junctions particularly if the junction treatments ignore the presence of cyclists and try to maintain convenience for motorists. Two-way cycle paths or paths that attract two-way use can be particularly problematic with the “wrong-way” cyclists at much higher risk of collision with turning motor vehicles. One exception to this rule however is if you are following a feature such as a river bank, canal tow path or a coastal route. These types of route have reduced junction conflicts and are ideal for two-way use. One successful example in Ireland is the Grand Canal cycle path in Dublin which has traffic lights for the cyclists where it meets roads crossing the canal. In Galway there are limited sections of coastal cycle path at South Park and behind the Golf Club between Black rock and Gentian Hill. 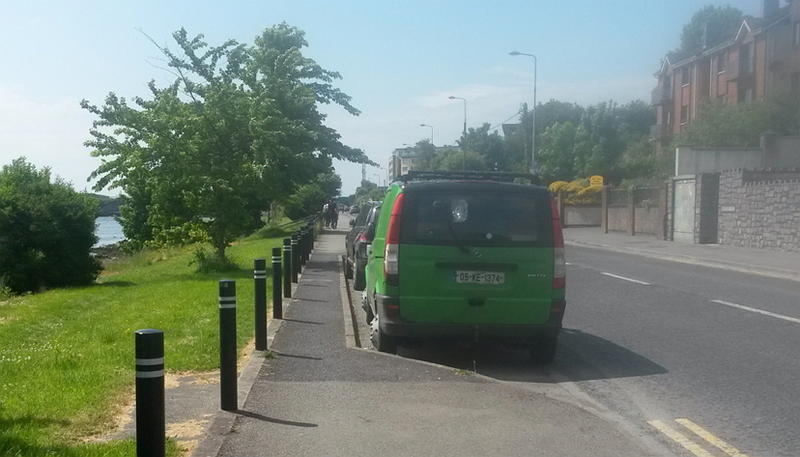 One section of de-facto coastal cycle path was the seaside path at Lough Atalia which connects with paths leading to Lakeshore drive in Renmore and is a handy low-traffic route into the city from Renmore/Mervue and the GMIT (or vice versa). Figure: The new bike share station. There is a playground to the left. Apparently bike share users and children are expected to cycle on the main road, which is also the main traffic access route to the Galway Docks. What does design guidance say? So what does design guidance say about using a path like this as a cycle route or a connection in a cycle route? The NTA publishes a cycle manual that has some problems but is an obvious reference (the NTA are part funding and overseeing the scheme). Working off their “width calculator” we can get a figure of 3m for a two-way road side cycle track. Transport Infrastructure Ireland also publish a manual for rural cycle ways. For low volume cycleways this has a desirable minimum width of 3.0m but provides “steps” down of 2m and 1.75. In the UK Local Transport Note 02/08 “Cycling Infrastructure design” has this to say for roadside shared use. 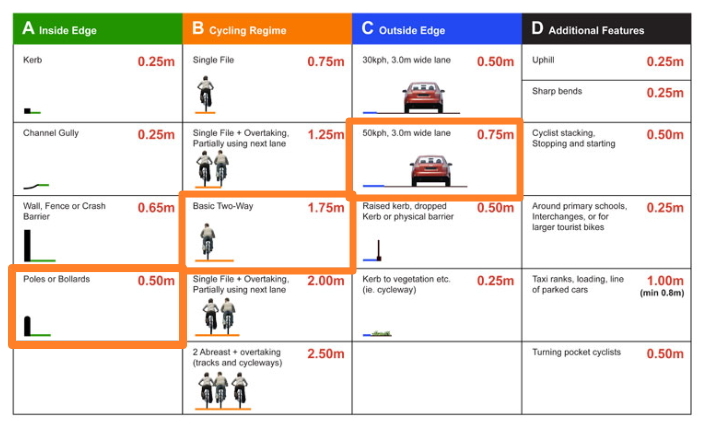 In the Irish NTA cycle manual there is also diagram that shows 4m for two-way roadside cycle tracks – 2m in each direction so lets treat this as a target level of service. How wide is the actual seaside path at Lough Atalia? At the playground/bikeshare station where we find one of the “no cycling” signs, the path is 2.9m wide. For a long section it narrows to 2.7m and at one point there is a small parking bay where the effective width is 86cm (the width needed for a door into a wheelchair accessible toilet is 90cm). Down near the Galmont (ex-Radisson) hotel the path is 3m wide before the road splits into stacking lanes for the traffic lights at Fairgreen road. At the pedestrian crossing the width is 1.97m. Figure: The Lough Atalia Path, at this point the path is 2.7m wide it varies from 3m to 2.9m with one pinch point at a parking bay. Figure: The parking bay pinch point – the path here is 86cm. The strategic value of this feature is open to question. Despite this, in apparent defiance of available design guidance, and while putting in a bike share station, the City Council, Coca-Cola and the NTA between them decided to formally ban bike share users and other people on bikes from using a very obvious and established feature for accessing the city. As with other council activities associated with the Coke-zero scheme the reaction has been seething anger from many regular users of the route. 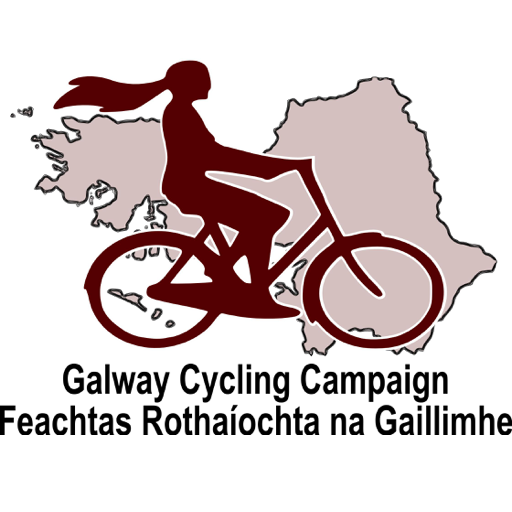 The Galway Cycling Campaign is forming a specific action group to look at the issue of a coastal cycling route from Oranmore to Barna. If this is an issue that affects you then why not become a member and get involved? Campaign submission argues planning board should reject application and order new Environmental Impact Assessment Report. In August Kerry County council made an application to An Bord Pleanála for the so called South Kerry Greenway running roughly parallel to the N70 national route for 30km between Glenbeigh and Cahersiveen/Reenard on the Iveragh peninsula. To achieve their proposed design, the county council propose to acquire by compulsory purchase order (CPO) sections of the abandoned Valentia railway. This railway was abandoned in 1960, the rail lines lifted within two years, and much of the land sold or transferred back to the farmers along the route. The misguided and unhelpful conduct of some recent “greenway” projects by local authorities has been hugely damaging to the brand of cycling and created needless acrimony between farming and cycling interests. The South Kerry scheme could set a positive or negative national precedent. If conducted incorrectly, it could set the national farming community in opposition to greenway projects for a generation. 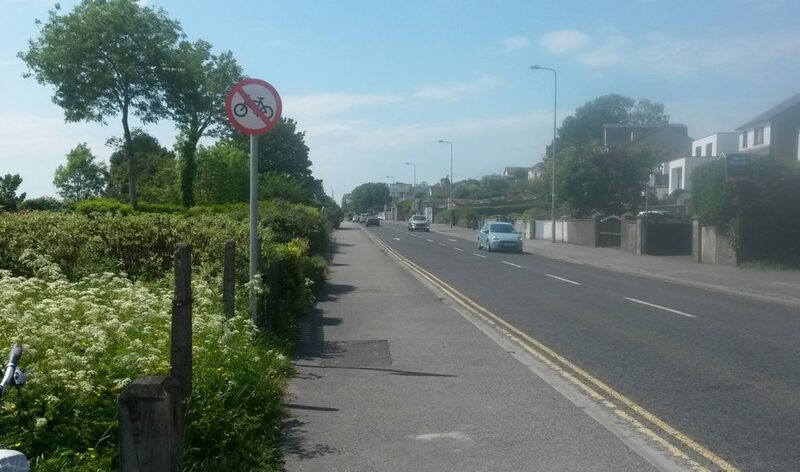 The Galway Cycling Campaign wishes to avoid this outcome and has made a submission to An Bord Pleanála. The published EIAR does not appear to include commonly accepted alternatives recommended by the applicable policy frameworks. The EIAR consultants make no apparent mention of using minor country lanes or boreens. This option if available could involve little engineering and would be less environmentally damaging than any of the proposed works in the EIAR. The guiding policy source in this instance is the 2009 National Cycle Policy Framework (NCPF). Under Ministerial Circular PSSP 8 – 2010 the NCPF is a national policy under the terms of section 9(6) of the Planning and Development act regarding development plans. Objective 3 of the NCPF provides for a national cycle network that may include greenways and disused railway corridors but also makes extensive use of minor roads. The NCPF references the 2007 Fáilte Ireland Cycling Strategy, which proposed an Irish Cycle Network using “the network of country lanes and roads throughout the country. These roads have been chosen where traffic levels are light and lanes have a line of green grass up the centre“. We find no discussion of this option – even to dismiss it – in the EIAR. Other countries make extensive use of minor country lanes to provide long distance cycling routes. The South Kerry Greenway is supposed to be a component in EuroVelo 1 the Atlantic Coast Route. We have discussed the Eurovelo guidelines previously in relation to the problematic Dublin Galway Greenway proposals. Tourist cycling routes should be kept well away from heavy traffic but they do not need to be completely traffic-free. Across Europe cycling tourists and family groups make extensive use of low-traffic roads as part of local and national cycle networks. This model is not simply a matter of passively finding roads that match the criteria. Local authorities will actively manage minor rural roads to reduce and divert inappropriate motor traffic and provide for walking and cycling. There is no legal impediment to doing the same thing in Kerry. The ordnance survey map shows a range of minor roads on the Iveragh Peninsula that might form part of the proposed route. Possible options can also be found using Google Streetview. CPO is an intervention that is not be treated lightly and the requirements of natural justice must be seen to be followed. If the use of obvious alternatives is not dealt with in the current EIAR then it will have to be dealt with at any oral hearing. Any such discussion at an oral hearing may be incomplete and will happen without formal prior consultation with affected parties along the alternative routes. This reinforces the need to reject the current application and require a new EIAR that reflects the relevant EU and state policies. 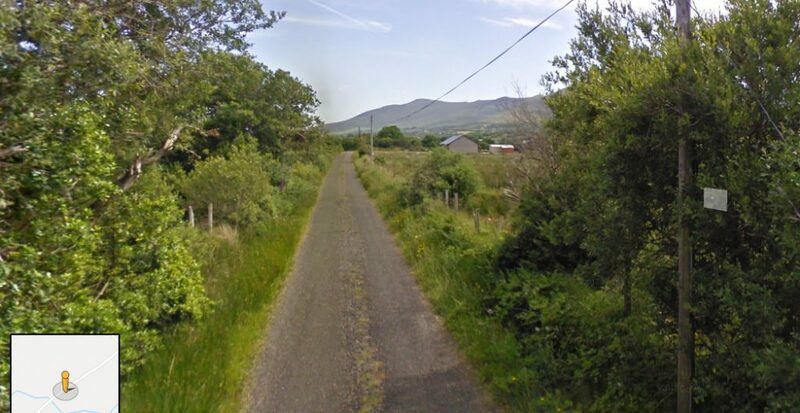 Google street view screen grab showing a country lane on the route between Mountain Stage and Cahersiveen. Local farmer on his bike courtesy of Google street view. An Bord Pleanala have rejected an application in Oranmore for a large (212 unit) housing development under the new strategic housing process. The grounds given include that it will impact on an area of land that is recorded as a wintering site for White Fronted Geese. In their refusal, the board cite impacts on the Inner Galway Bay, Creggana Marsh and Rahasane Turlough Special Protection Areas. It should be noted that the current government’s controversial “mini motorway” model for the Dublin-Galway greenway will involve building a new road near the Rahasane Turlough. However this is an aside. 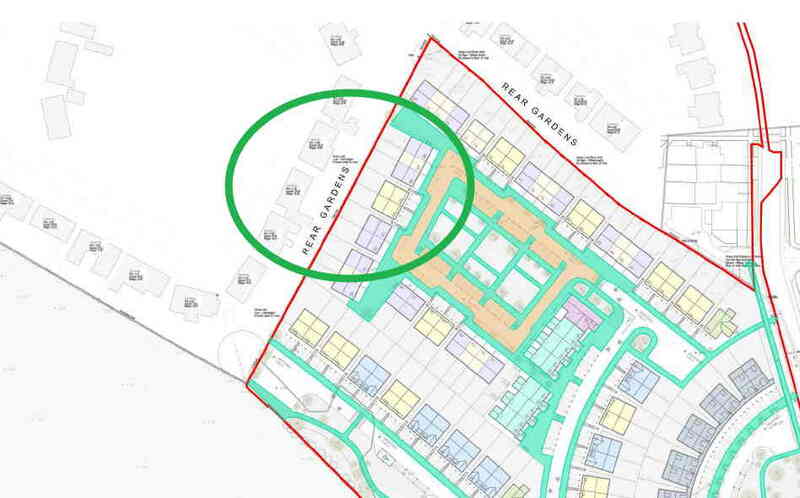 Why is the Galway Cycling Campaign interested this housing development? The reason is that it was viewed as an important test case for Government policy on sustainable transport. Accordingly over the summer we made a submission to An Bord Pleanala seeking changes to the design to favour active travel and child safety. The development “Arlum Oranmore” was to consist of 212 residential units, a crèche and an external play area. However on review we found the development to be conceived and laid out in a manner that is hostile the needs of sustainable transport – particularly schoolchildren. The layout of the development did not comply with the principles of the Design Manual for Urban Roads and Streets. The provisions for cyclist and pedestrian access were the same as the provisions for motorised traffic. Providing for people on foot or on bicycles was essentially treated as an appendage to providing for motorised traffic. The plans also clearly intended to direct arterial interurban traffic into residential streets. The Arlum site is located on the eastern side of Oranmore near the former N18 National Route. There are four schools within 2km of the site and all the schools are located on a similar alignment to the northwest. Existing roads providing a potential route to the schools carry fast and heavy traffic and have hostile junction layouts. In particular, there is a pair wholly unsuitable junctions that involve slip roads to and from the Maree Road. 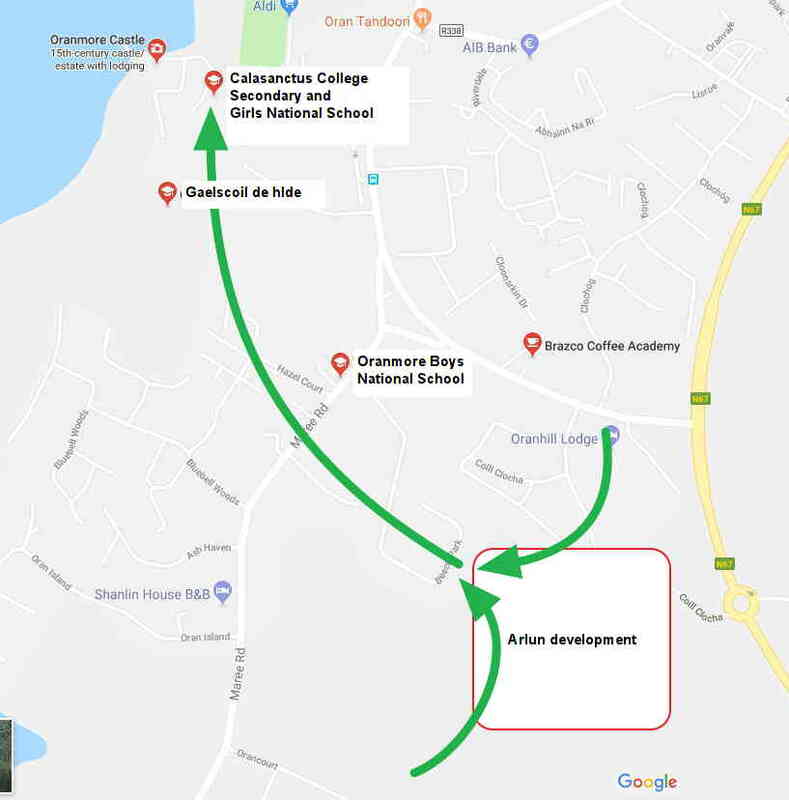 The site is on a clear desire line for a safe route to school not only for its own residents but also for children from adjacent developments at Oranhill to the south and Coill Clocha to the north. Figure: Google map extract labelled to show the site and the four schools located to the northeast. Potential desire lines for safe school travel are shown by the green arrows. junctions within Oranmore village and on the proposed travel line for children. In order to the comply with the principles of the Design Manual for Urban Roads and Streets we argued that the applicants should be required to provide safe attractive pedestrian and cyclist only links to adjacent developments. 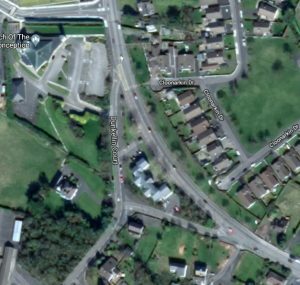 If links were provided to Oranhill to the south and Coill Clocha then an additional link to Beech court would give children a route to school using mainly residential streets and roads. Beech court was constructed using an unsustainable car-dependent cul-de-sac based layout and there was now an opportunity to remedy this mistake and provide a safe link for children. Figure: Planning file extract showing the northwest corner of the site where it backs onto Beech court. There is scope here to provide a safe route to school by providing a link. Our submission to the board argued that as a planning condition a gap should be constructed through to Beech court. The developer should be required to obtain and demolish existing dwellings in Beech court so as to provide a safe school route. It might be possible for the developer to simply construct equivalent dwellings for the current Beech court occupants elsewhere in the Arlum development. Section 3.3.3 of the Design Manual for Urban Roads and Streets refers specifically for a need to retrofit existing areas to create more sustainable neighbourhoods. The proposed link to Beech court is an example of exactly the type of works needed and could have set an important precedent for other projects under the Strategic Housing Development process. A similar observation applied to the boundary of the Arlum development and Oranhill to the south. The Arlum development “backs on” to Oranhill instead of integrating with it. The applicant’s drawings appear to show dwellings in Oranhill backing onto their development. As with the boundary to Beech court we argued for the plans to be rearranged provide a coherent and attractive walking and cycling only link between both developments. There was reference in the planning application to a north south distributor road. It turned out that the intent was to re-purpose existing exclusively residential streets in Oranhill and Coill Clocha as some form of distributor road. Indeed the Traffic and Transportation Statement by stated that the new roads arrangements were intended “to operate as a link road to serve traffic from the N67 National Route to the Maree Road”. The new road would start an existing but incomplete roundabout on the old Limerick road south of Oranmore and use residential streets to connect through to the Maree (coast) road. In our view this was wholly unacceptable. If Galway County Council perceived a requirement for a relief road linking the N67/former N18 and the Maree road then they should set aside lands for that specific purpose. Due to car dependency imposed by poor planning practices, there is extensive peak hour traffic congestion on the outskirts of Galway. This has resulted in a problem with rat-running at various peripheral locations that offer potential alternative routes into the city. In this case creating this proposed distributor road would provide an obvious link for arterial traffic trying to use the coast road as a means of avoiding queuing at junctions on the main roads in or out of the city. This type of traffic is incompatible with the “place function” of this area as a residential amenity. In our submission we argued that the internal roads should be rearranged to prevent through traffic or that the link to the old N18 (N67) be dropped. It should be noted that the planning files contained an assessment of the impact of traffic from the housing development on the main roads but contained no assessment of the impact for local residents of routing arterial traffic through their streets. The planning Board’s decision to refuse on environmental impact grounds was probably a correct decision based on the information available. It may also set an important precedent for other environmentally hostile developments such as the current Dublin-Galway greenway proposals. However we will have to find another place to fight the battle on safety and safe access for vulnerable roads users.